You can also create new, empty documents in NVivo and type up your content—for example, you could type up your field notes. Documents can be moved into the Memos folder—for example, if you import a document that contains your ideas, observations or notes about the progress of the project, you may want to store it as a memo under the Memos system folder. You cannot move PDF files into the memos folder. If you import content from OneNote or EndNote, then document or PDF files may be created in the process. You can use NCapture to gather files from the web and then bring the web content into NVivo as PDFs. The captured web content is stored in an NCapture file (.nvcx) on your computer, and is converted to a PDF when you import it into NVivo. In Navigation View, click the name of the files folder that you want to import the document into. On the Data tab, in the Import group, click Documents or PDFs. Browse for and select the file you want to import. (Optional) Change the name or description of the new file. You cannot import password-protected Word documents. You can print (as PDF) directly from other applications to NVivo. In the print dialog, click the PDF pop-up menu and choose Add PDF to NVivo. It will be imported into your currently open NVivo project as a PDF file. Double-click a document or PDF file in List View to open it in Detail View. When you open a document, it opens in read-only mode. You can code, annotate and link the document when it is in read-only mode. If you need to edit the content of the document,. click the Edit button (at the top-right of Detail View) to switch to edit mode. You cannot edit PDF files in NVivo—so you cannot switch to edit mode when you are working with a PDF. PDF files can include bookmarks. Bookmarks are displayed in a pane on the left side of Detail View. Click on a bookmark to jump to a specific location in the PDF. What can I do in a document or PDF? The way you select content to code, annotate and link varies slightly between document and PDF files. You can edit the content of documents. PDF files cannot be edited. You can hear a selected passage of text read aloud. When you are working in a document, you can select and code text or images. 1 Select portions of text—click and drag with the mouse to select the text you want to code. 2 Select entire images by double-clicking. 3 Select images or text contained within the table. 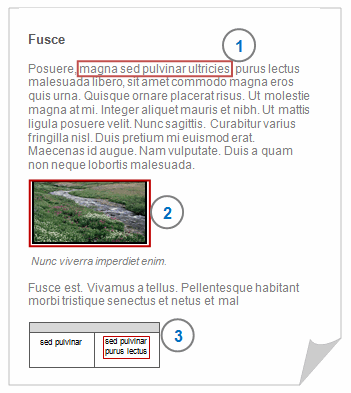 When you are working in a PDF, you can select text or regions of a page. 1 Select portions of text. You can also double-click to select a word and triple-click to select a line. 2 Select regions of a page. You can double-click to select an image and, if you switch to region mode, you can click and drag to select a region of the page. When you select a region, you are making an image selection, even if the region you select contains text. To switch between text and region, choose a Selection Mode from the top of Detail View. PDFs that are created by scanning paper documents may contain only images—each page is a single image. When you import the PDF into NVivo, you will find that there is no text in the page to select, code or query. You can select and code regions of the page, however you are coding an image selection and you cannot use Text Search or Word Frequency queries to explore the text. If you prefer to work with text (rather than images of text), then you can try using the Recognize Text feature to convert the image-based text into content that you can select, code and query. NVivo tries to determine the order of text on a PDF page, however when you select text, you may find that the text on the page is not sequenced as you expect. If you cannot select the text in a PDF, this is probably because the PDF was created by scanning a paper document. For example, this can happen when you scan printed reports or articles. Depending on the layout and format of the PDF, you may be able to use the 'Recognize Text' feature to turn the text into content that you can select, code and query. Open the PDF in Detail View. Click Recognize Text at the top of Detail View. The button is disabled if the PDF already contains codable text. In the preview window, select a section of text. 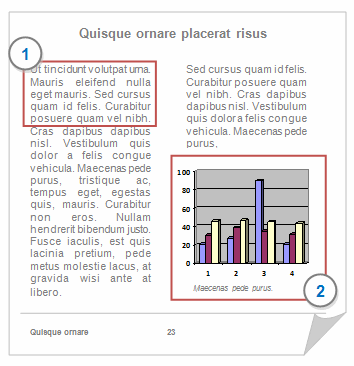 A pop-up is displayed showing the results of text recognition. If the text looks good, click Update PDF to save the PDF with codable text. If the text does not look like an accurate representation of the content, click Cancel to keep the PDF in its original state. Poor results may indicate that the format of the PDF is not suitable for text recognition.